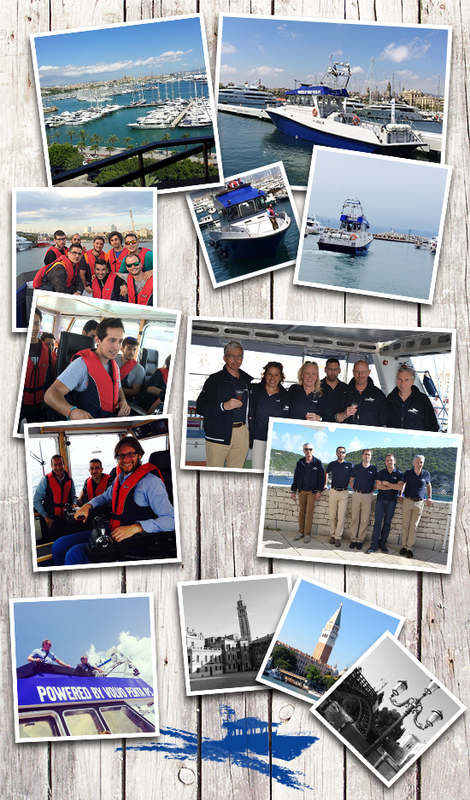 The PTA80 departed from Lavrio, Greece, this week, bringing the Volvo Penta IPS Med trip to a close – but we couldn’t end the blog without a final look back at everything this journey achieved. Although this year’s journey will be the PTA80’s last tour around Europe — following the Channel trip last year and the Baltic trip in 2011 — the vessel leaves behind an important legacy. Each of the Volvo Penta IPS trips has highlighted the benefits of using a hands-on approach to marketing and advertising the unique benefits of the inboard propulsion system. Especially within Volvo Penta’s Marine Commercial sector, the try-before-you-buy approach has played a huge part in allowing the company to present itself as a key player within the professional market. “At the Seawork exhibition in Southampton this summer, we noticed significant growth in the number of boats fitted with Volvo Penta IPS compared to last year’s show,” Jan-Willem Vissers, Sales Director for Marine Commercial Europe, explains. “This lines up with the positive feedback we’ve been receiving from European customers who appreciate Volvo Penta’s efforts to bring the product to them. Something is obviously working. The unexpected stopover in Lavrio meant that participation at sea trials and seminars could be extended even further. Despite customers from Israel and Turkey being unable to attend due to the short-notice, initial interest from these regions was significant, proving that customers keen to experience Volvo Penta IPS extend beyond Europe. Although the Med trip is now over, with no more scheduled tours planned for the region, Europe will continue to benefit from pin-pointed activities designed to continue targeting potential customers — proving that the practical approach works best when it comes to showcasing Volvo Penta IPS. This entry was posted in Uncategorized on June 27, 2014 by Volvo Penta. PTA80 left Lavrio on June 24th and she is now travelling home on a yacht transport, planned to arrive Kalundborg on July 6 th, where Klas and Björn will pick her up and go the last 120 d – 6 hour journey back safely home. This entry was posted in Uncategorized on June 26, 2014 by Volvo Penta. A last minute extension to the Volvo Penta IPS Med trip made the sea trial experience available to Israeli, Turkish and Greek customers in Lavrio, Greece, this week. With only a few days to spare before the PTA80 was scheduled to make her way home from Lavrio, Greece, to Gothenburg, Sweden, on the yacht transport ship Mitiq, organizers decided to hold a spontaneous boat trial at the Greek port, allowing the Israeli, Turkish and Greek Marine Commercial markets a chance to experience the benefits of Volvo Penta IPS firsthand. Despite having only a week and a half to prepare for the unexpected stopover, organizers managed to pull together an impressive event: the PTA80 was moored in Lavrio’s Olympic Marine, an excellent location for potential customers to make the most of the sea trials – and with a seminar room only a stone’s throw away, Marine business segment manager and one of the event’s organizers Grethe Loretan Yllö said she was satisfied with how things turned out. On June 23 the PTA80 will travel back to Gothenburg, leaving behind beautiful (and sunny) Lavrio. Although this is farewell for now, the Med trip will hopefully return next year with another fantastic route. This entry was posted in Uncategorized on June 18, 2014 by Volvo Penta. 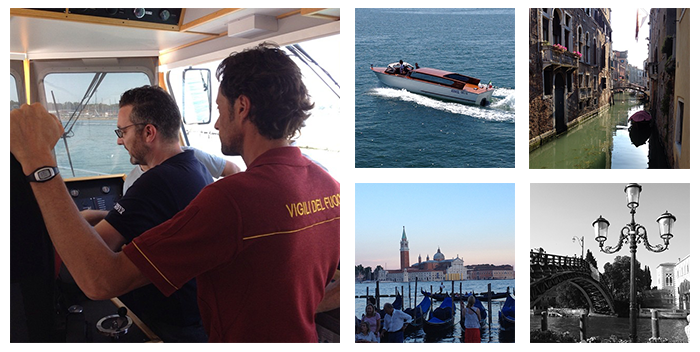 Italy’s floating city provided a spectacular backdrop to the Volvo Penta IPS Med trip. There’s an old saying in the Veneto region of Italy: All true Venetians are born with the ability to swim. Venice’s complex and intricate connections to water are renowned and stretch back centuries, making the ‘floating city’ a cornerstone of maritime history. The sea trials and seminars were some of the most successful yet, with a fantastic turn-out from many different potential customers, who made the journey from around the region to learn more about Volvo Penta IPS. With the Italian sun shimmering overhead, the PTA80 and her crew took to the open waters just off the island. Visitors were highly impressed by the comfortable ride afforded by Volvo Penta IPS, not least because many were used to noisy or vibrating systems. With fire brigades, coastguards, shipyard investors and ferry boat operators in attendance, Volvo Penta IPS really rocked the boat in Venice. This entry was posted in Uncategorized on June 12, 2014 by Volvo Penta. The PTA80’s second-to-last stopover in Split, Croatia, attracted attendees from across Southeastern Europe. Visitors traveled from far and wide to attend the PTA80’s penultimate stopover in Split, Croatia, with guests from Hungary and Bulgaria driving over twenty hours to attend the first day of seminars. Many aboard the PTA80 during sea trials were initially unconvinced by her precise maneuvering capabilities—until the vessel moored at a 60-degree angle between two multi-million-euro yachts. Although many feared that this tricky positioning would end in disaster, the captain and crew managed to moor the PTA80 without a hitch. The Hansson brothers, Thomas and Tobias, will leave the PTA80 on her second day in Split, handing over the reins to Niclas Ebentbratt and Stefan Heineras. The new crew take over the second day of sea trials and will drive the boat from Split to Venice for a three day event first before heading for Lavrio in Greece, traveling through the Corinthian Channel en route. This entry was posted in Uncategorized on June 10, 2014 by Volvo Penta. 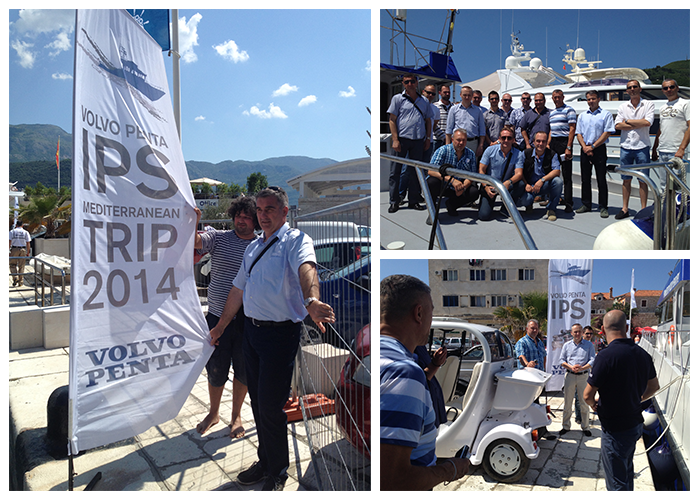 The Volvo Penta IPS Med Trip made a quick stopover in the tiny Montenegrin resort town of Budva this week, seeing 20 guests before heading up the Adriatic Coast. Budva, Montenegro, was one of the Med Trip’s shortest stopovers. With a tight schedule and no off-day scheduled between the Budva stopover on the 4th and the Split, Croatia, stopover the next day, the PTA80 and her crew left the Montenegrin port in a hurry on Wednesday. To make it to their next port in time, the crew held sea trials in the morning — rather than after lunch — and left port by 1 pm. Though the stop was a quick one, the Volvo Penta team still managed to meet with 20 people from Montenegro and Serbia — as well as operators and representatives from a shipyard and the local Volvo Penta Center in Romania who made a lengthy two-day drive to attend the seminars. Attendees included maritime police, the Montenegrin ministry of defense, naval architects, journalists and municipal authorities. This entry was posted in Uncategorized on June 5, 2014 by Volvo Penta. 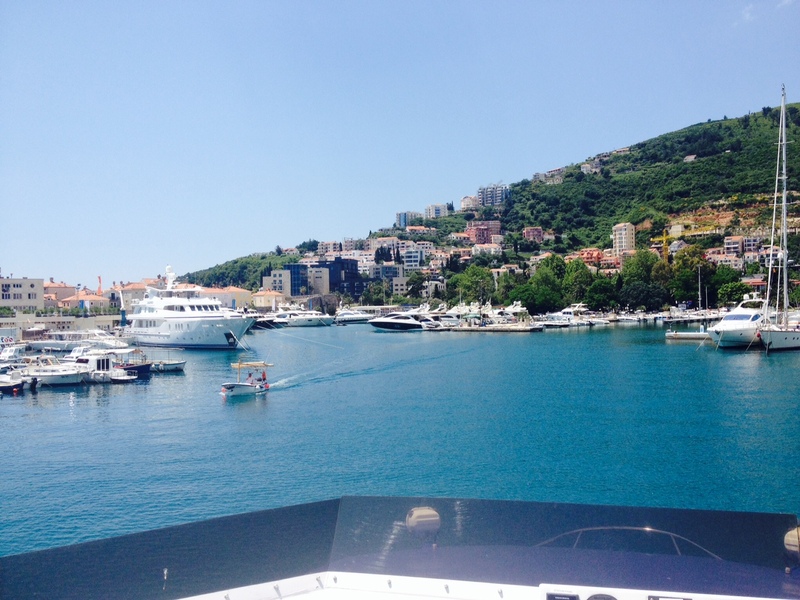 Stopover in Budva – a coastal town in Montenegro with around 20,000 inhabitants. The coastal area around Budva, called the Budvanska rivijera is the centre of Montenegro’s tourism and well known for its bright sandy beaches and Mediterranean architecture. Budva is 3,500 years old – one of the oldest settlements on the Adriatic Sea coast. This entry was posted in Uncategorized on June 4, 2014 by Volvo Penta.